NHSDF participants with Point Park University alumni Ahmad Simmons and Ian Spring from Parsons Dance Company. 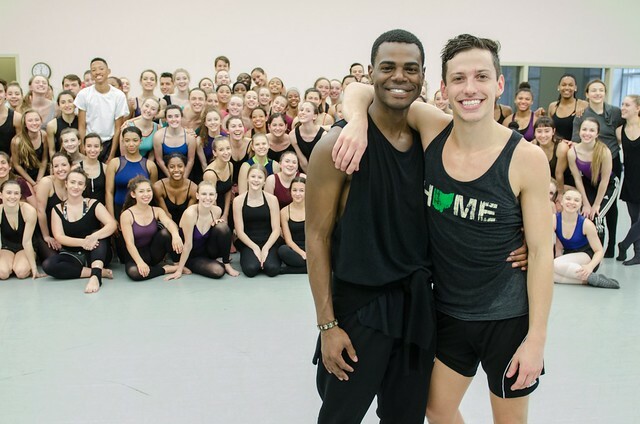 Dance alumni Ian Spring and Ahmad Simmons - members of Parsons Dance Company in New York City - returned to Point Park's campus to teach a master class at the 2016 National High School Dance Festival. Held in the George Rowland White Performance Center's studio 3, more than 70 high school dancers participated in the 80-minute class on Friday morning. Learn more about the alumni and the master class in the interview below. What does it mean to you to teach a master class at NHSDF? What's it like returning to Pittsburgh and Point Park University? Coming back to Point Park for NHSDF is surreal. I love Pittsburgh and I love Point Park! Point Park is where I learned my craft, discovered who I am as a person and as a dancer. What key message do you hope students took away from the class? What do you enjoy most about being a dancer? NHSDF continues through March 6. Watch for continuing coverage on PointPark.edu, as well as updates on Facebook, Instagram and Twitter. Share your NHSDF experience on social media using #NHSDF2016.